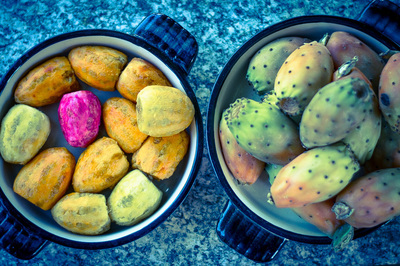 There are countless differences that distinguish Sicilians from Italians. Gastronomically speaking there are interesting discoveries to be made. Sicilians love bread and have 72 different kinds! 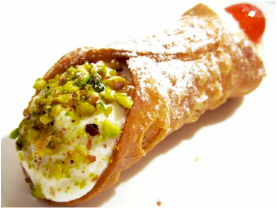 There are numerous desserts from the island including the much loved 'cannolo'. The popular lunch-time snack 'arancine' certainly has a touch of Arabic genius about it. Ice-cream is often eaten in a type of bread 'brioche al gelato'. 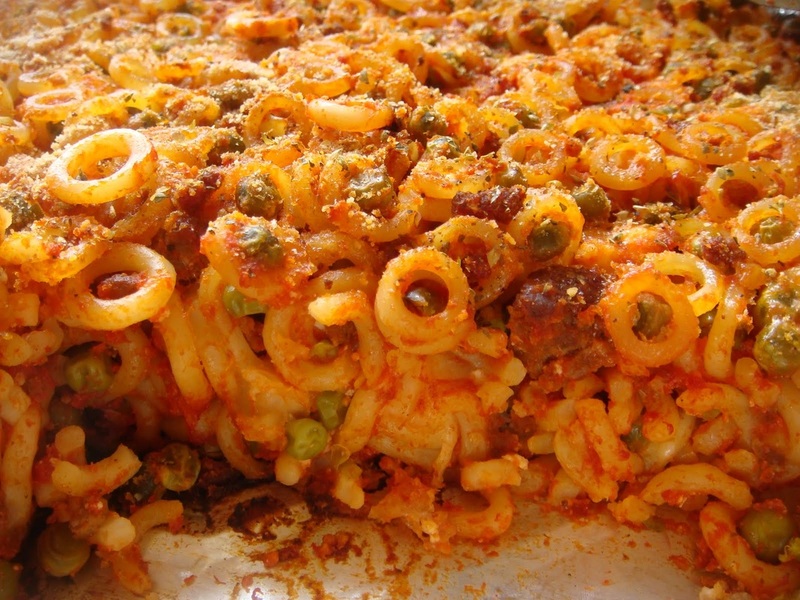 Many pasta dishes are either tomato based or seafood based which reflect the fresh organic produce found locally. Sicily is now also one of the most important wine-producing areas in Italy. Street Food in Sicily- Palermo has been elected the European Capital of Street Food. In a recent ranking by Forbes, it was listed among the top five in the world for cities with great street food, holding the top spot in Europe. Among the delicacies offered by street vendors, we find arancini and pannele (simple squares of fried, smashed chickpeas and herbs that are eaten with bread). The sfincione is a local version of pizza, made with tomato sauce, caciocavallo cheese, onions, and anchovies on top of a thick and soft crust. For those with a stronger stomach, options abound. 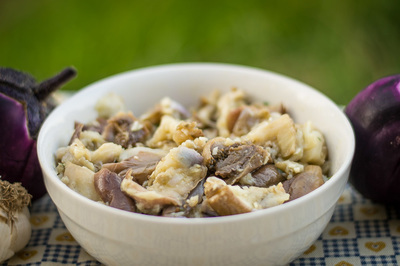 The panino con la milza (or pane ca meusa in Sicilian dialect) is a sandwich made with chopped veal’s lung and spleen that have been boiled and then fried in lard. The stigghiola consists of a of sheep’s intestines on a skewer. 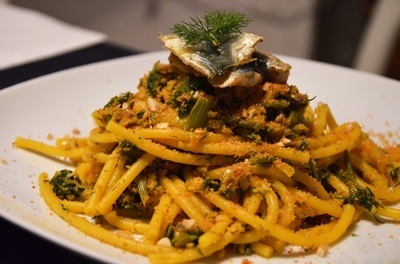 Or try our great rural but tasty pasta con le sarde and Anellini al Forno to finish up with a Lemon Granita a semi-frozen drink made with crushed ice and lemon or other flavors. Mix all above into a pot and warm it up for 5 minutes to let all melt well together. Then Freeze it. Before eating it take it our from freezer 5/10 mins before hand. Then enjoy it. Cut dough into few equal pieces. Flatten each piece into rectangle until 3/4 mm; Repeat with remaining pasta pieces. 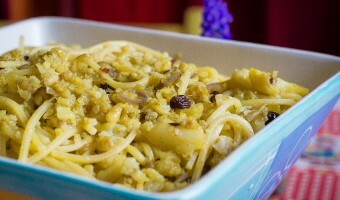 Cut the shapes of your wish "mal tagliati" - typical rural casual cupping pasta for "ragu dish". Cover with flour and then with towel and let stand at room temperature. 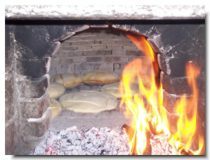 Pizzeria with wood oven ! 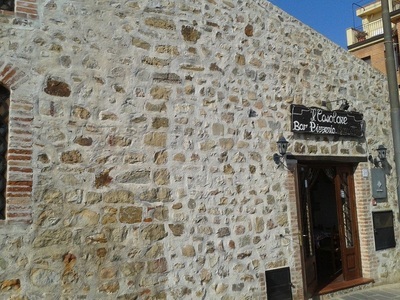 Wonderful Pizzeria in Finale: Casolare and Nauticus! Place flour (hill shape). Add salt, sugar, and olive oil. Warm up in pot water and melt yeast to rich brown blend. Then add the yeast to the flour and hand Blend until clumps of moist dough form. Mix it hard to let the yeast and flour blend together to raise well. Let rest at room temperature for 3 hours and cover the ball with a bit of wet warm towel. Cut dough into few 2 pieces. Flatten each piece into rectangle tin (spread some olive oil into the tin to avoid the dough to stick) . Well then add topping and cook into the over at max heat for 16/20 mins based on over type. Try to potate topping (think slices and then a bit of cheese), or tomato sauce and mozzarella of course! Or even a bit of salt, olive oil and origano only is fine for a great focaccia bread. 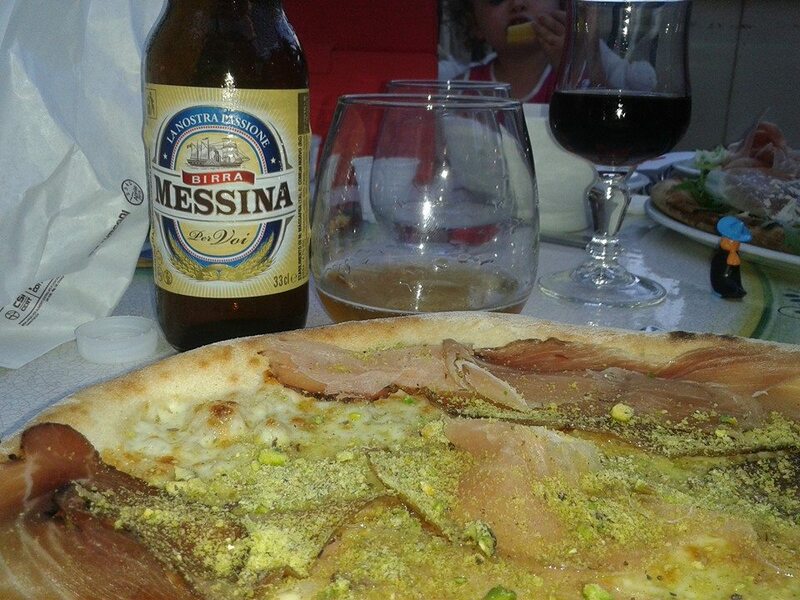 from San Mauro Castelverde - Valdemone DoP. Our local olive varieties in use: Santagatese, Ogliarola Messinese, Minuta, Mandanici, Nocellara, Ottobraitica, Brandofino and Verdello. 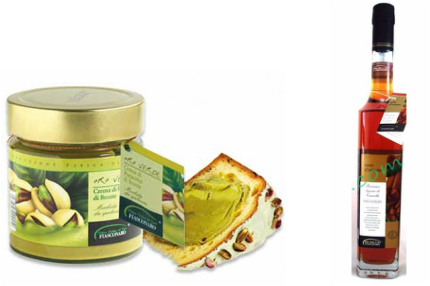 The oil has a golden yellow colour with a fruity aroma of freshly picked olives. The taste has a slight aftertaste of almonds, fresh fruits, tomatoes and chard. A bit about our Valdemone DoP "Olive oil" has an ancient history. According to Hebraic traditions the olive tree and its oil were man's friends in that mythical place known as " eden". It is the bible that attributes divine origins to the olive. Our extra virgin olive oil has the maximum free acidity in terms of oleic acid of 0.9gr per 100g of absolutely perfect flavour and odour. We always preserve our oil from high temperature, light and oxygen in the air. Olive oil has been much more than mere food to the peoples of the Mediterranean: it has been both medicinal and magical, an endless source of fascination and wonder and the source of great weath all oil based. Olive oil picking is a great family gathering around the months of October to January. The picking is a magical way to enjoy nature, olive trees branches, and to experience the running of olives into the nets from our grounds. From the olives' net, the leafs are then removed and the olives are washed to eliminate traces of dirt or substances. The olives are then crushed in granite millstones to produce the thick paste. Then spread on fibre "fiscali" which are piled on top of each other and placed in a hydraulic press to extract the juice which is a mixture of oil and vegetable water. The final step separates the oil and water, classically by gravity but nowadays through a centrifuge. Olive oil is one of the main ingredients of our diet. Thanks to its wealth of antioxidants and high monounsaturated fatty acid content it helps to reduce cholesterol levels in the blood which in turn reduce the risks of cardiovascular diseases. 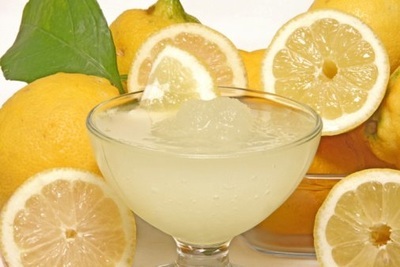 It also stimulates intestinal and stomach protection from gastritis and ulcers. Well get some in your local store. Or email us and we can source some for you. 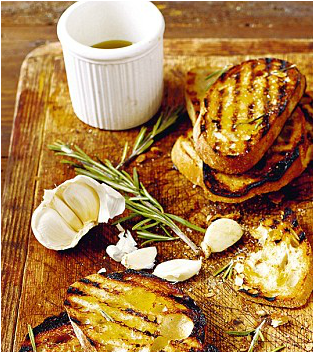 Typical Garlic and Olive Oil Bruschetta, slice and toast some bread (ciabatta), spread some fresh crushed garlic on your toasted bread and drizzle the olive oil with some salt, pepper or chilli. Maggie is an Italian mum in Ireland. Baking and Cooking addicted. We all love her food! So we want to share her passion... Ciao Maggie. Sicilian Fichi D'India Prickly Pear Cactus Fruits, Sicilian Aubergine Salad, or Pasta With Cauliflowers Sicilian Style. Along these Sicilian dishes Maggie recognizes the typical ingredients that the Arabic influence left in the culinary art of Sicily. The Antico Forno Madonia is a sicilian bakery that has been baking bread & cookies for a lasting generations according to the receipts and the secrets of its founders. 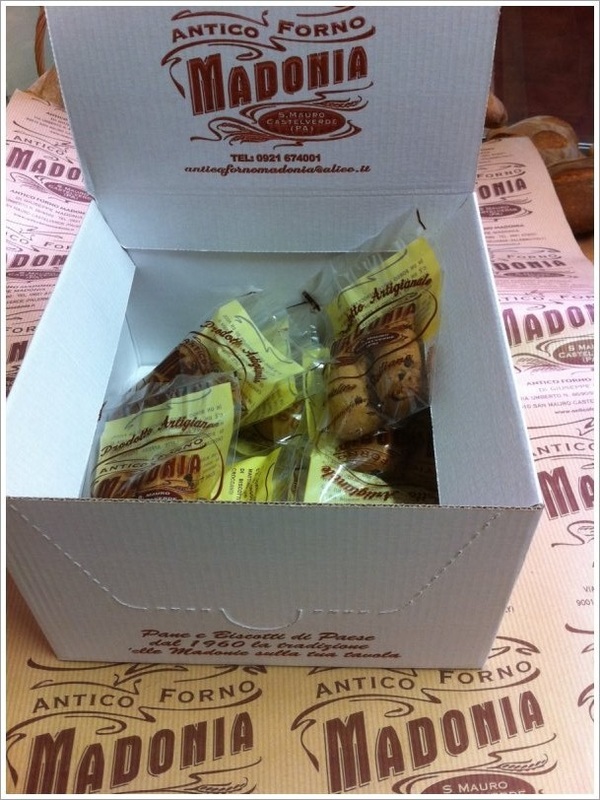 Pino's Family have always took care from the taste, quality and the authenticity of Antico forno's products. From three generations the "the Ancient town Bakery - " of Madonia's family bakes bread and cookies using ancient receipts and genuine ingredients of our town. 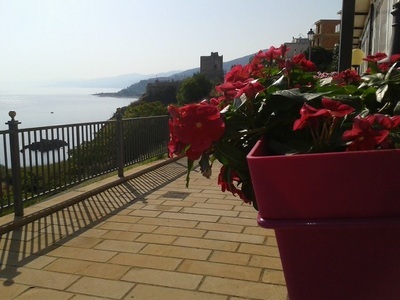 San Mauro’s mountain landscape, the ancient cooking traditions, the country receipts, the lands far away from modern civilization, represent the right settings where the wise art to create homemade cookies for everyone. 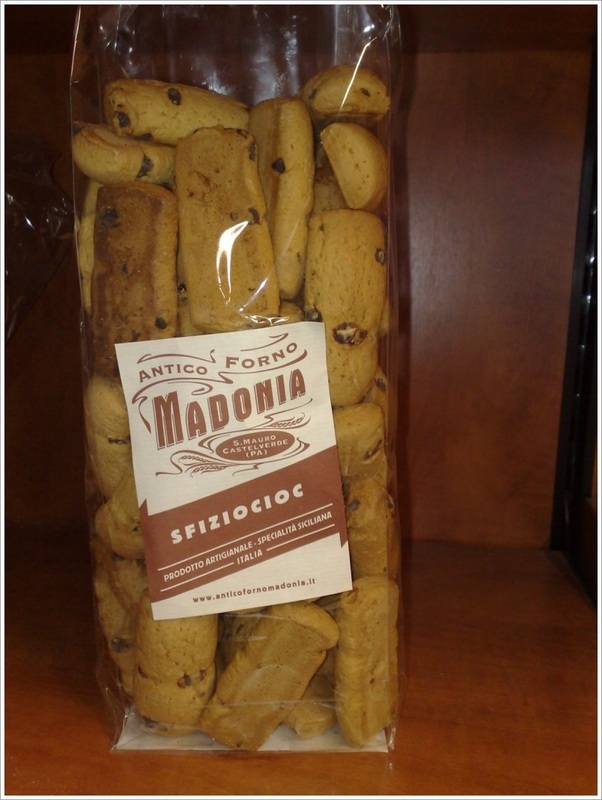 The scent and the fragrance of the "pastine al latte" cookies are few of the frames of adults and children's memory and of that part of Sicily where the Antico Forno Madonia lies. Ciao ciao Pino and Family from LYS giovanni.